Back in the 1950s, stay-at-home moms cooked meals from scratch while kids ran and played outdoors till dinnertime. Fast-forward to the dual-income or single-parent families of the 2000s. Bone-tired at the end of a workday, parents now are more likely to nuke a frozen pizza or open a box of mac ’n’ cheese than create a square meal from fresh ingredients. And latchkey kids munch on Doritos and Mountain Dew while playing Grand Theft Auto or texting friends, in contrast to their last-century counterparts who snacked on milk and homemade oatmeal cookies before hopping on their bikes or grabbing their baseball mitts. 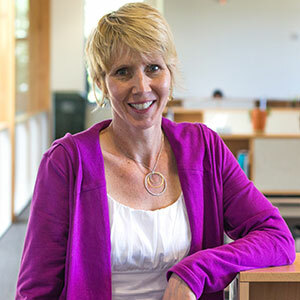 CPHHS Assistant Professor Deborah John. The route may be easy, but it can pave the way to some really hard knocks later on: obesity, diabetes, heart disease, even depression and low self-esteem. Everyone knows that Americans are too fat and getting fatter. Fully two-thirds of adults and one-third of children tip the scales at unhealthy weights. But figuring out what to do about a problem so tightly stitched into the cultural fabric is a big unknown. Finding answers is a research priority at the CPHHS’ Hallie E. Ford Center for Healthy Children and Families. 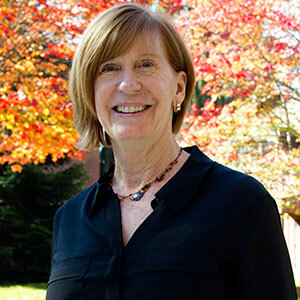 An example from the center’s “obesity research core” is a five-year, multistate study led by OSU researchers Deborah John and Kathy Gunter in the CPHHS. The $4.8 million project, funded by the U.S. Department of Agriculture, targets schoolchildren ages 5 to 8 in rural towns, places where distances are vast and resources are scarce, where fresh produce is hard to come by, where roadsides give way to dust and mud rather than sidewalks and bike paths and where families struggle to make ends meet as local economies shift and jobs vanish. The states of Colorado, Idaho, New Mexico, Nevada and Washington are project partners along with Oregon. In Southern Oregon on the eastern slope of the Cascades, the town of Chiloquin huddles at the confluence of two rivers, the Sprague and the Williamson, renowned among fly-fishermen for trophy-sized trout. These high-elevation streams run fast and clear through an eclectic mix of ecosystems: ponderosa pine forests, rangelands scented with sage, lakes and marshes alive with migratory swans, geese and long-legged wading birds. This land is beautiful and bountiful. Yet the children who live here are among Oregon’s most challenged. Struggling families, many of them descendants of the first peoples to hunt and forage in the timbered hills and teeming wetlands — the Modoc, the Klamath, the Yahooskin Band of the Snake Paiute — are scattered across hundreds of acres. Round-trip bus rides to school can steal an hour or more from a child’s day. Jobs are scarce now that logging has slumped. Unemployment tops 25 percent. CPHHS Associate Professor and Extension Specialist Kathy Gunter. On the edge of town sits little Chiloquin Elementary School, neat as a pin. The linoleum floors are polished, the classrooms are cheery with primary colors, the cafeteria clanks with pots and pans, homey and comforting. But scratch the surface and the picture is less idyllic. Low scores on statewide tests rank Chiloquin in the bottom 5 percent statewide for academic achievement. And there’s another troubling number: Students here are some of Oregon’s most overweight. As measured by “body mass index” (BMI) — the ratio of height to weight — 40 percent of Chiloquin’s first- through sixth-graders are overweight or obese, compared to the statewide average of 25 percent. Oregon State’s project, dubbed “Generating Rural Options for Weight-Healthy Kids and Communities” (GROW-HKC for short), brings together researchers from multiple disciplines (public health, nutrition and exercise sciences, human development and family sciences, education and Extension) in partnership with schoolteachers and administrators, students, parents and community members in three Oregon counties — Klamath, Clackamas and Columbia — to study obstructions and opportunities for better nutrition and physical patterns. The approach hinges on its participatory nature. Case and her Extension colleagues don’t just teach about healthy lifestyles. Rather, they partner on multiple levels (in the cafeteria, on the playground, at the community rec center) with a circle of constituents (local leaders, community groups, parents, school principals, P.E. teachers) to change the environment and make healthy choices the easy option. The OSU researchers, then, have embraced the broadest context for obesity, a context that includes neighborhood infrastructure, local policies, community awareness and cultural attitudes. Is there a readiness to change? Is there a capacity to follow through? One day in mid-December, Case steers the Klamath Basin Extension office’s Ford Explorer into Chiloquin and unloads a stack of boxes and tote bags at the school’s front door. Her mission: Get third-graders excited about whole grains. If that sounds like Mission: Impossible, you haven’t seen Case work a classroom. “Hello!” she greets the 20 little learners, calling their attention to the phrase “Eat Smart to Play Hard” projected on the screen at the front of the room. “Students, have you ever eaten the whole thing?” she asks, striding between the miniature desks and emphasizing the word “whole.” She repeats the question until they get the joke. “Whole grains!” the students chime with energy. 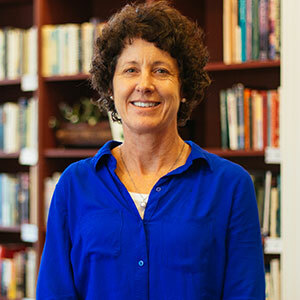 CPHHS Associate Professor Patty Case. After tying on her black canvas “Food Hero” apron, Case quickly gets the kids moving as she guides them through the lesson: Name the five food groups (“Clap once for each group!”). List as many kinds of whole grains as you can (“Hop on one foot and pick a grain!”). Explain how whole grains help your body work better (“Tell why grains are good for you and give a friend a high-five!”). Describe how food labels help you make better choices at the grocery store (“Leap like a frog and find the first ingredient on this package of honey-oat bread!”). Then, like a magician drawing her audience’s gaze to the stage, she waves her arm above the intriguing jumble of mixing bowls, measuring spoons and baking ingredients assembled on the front table. “Today,” she announces, dramatically placing a white chef’s hat on her head, “we’re going to make whole-wheat carrot pancakes!” Even the most fidgety kids are suddenly all ears and eyes. In clusters, they take turns measuring with precision, mixing with enthusiasm, and flipping with anticipation before at last chowing down on the golden-brown flapjacks. They jostle for Dixie cups of fresh-cucumber-infused water to wash down the whole grains. Then each child gets a copy of the pancake recipe to take home. This is, in part, where the larger community comes in: kids sharing their newfound knowledge with parents in pursuit of a ripple effect for healthier eating. After Case packs up her bag of tricks, she checks in at the office with principal Travis Fast about plans for a teacher training on building physical-activity breaks into classroom time. Next she pops into the cafeteria to talk with food manager Melanie Shelton about tactics for getting kids pumped up about eating right. One example: giving cool names (like “X-Ray Vision Carrots”) to menu items. Other examples: holding tastings where students vote on their favorite nutritious recipes, and creating posters and bulletin boards that nudge kids toward better choices. Finally, she heads to the gym to firm up plans with P.E. teacher Norm Barney for a springtime “walking challenge” where kids earn points for the miles they stride. Last year, with her camera at-the-ready on the passenger seat beside her, Case drove hundreds of miles across Chiloquin’s immense enrollment district to help map the area’s local “health environment.” Parents and other community participants in GROW-HKC traveled the highways, too, photographing convenience stores and cafes, rec centers and playgrounds, farmers markets and food pantries, clinics and churches, hunting grounds and fishing holes. The idea is to identify plusses and minuses, the aspects of community infrastructure that encourage, as well as discourage, healthy living. The photos not only paint a picture of strengths and needs in Chiloquin, they’re also part of a growing database documenting the challenges facing rural towns around the region. The elementary gym at Bonanza Schools is a storm of action one Tuesday in December. On the main floor, kids are throwing themselves into pushups, jumping jacks and other vigorous calisthenics, their voices echoing in the cavernous space. At the back of the gym, other students are kicking off their sneakers and stepping onto a set of scales as OSU Extension research assistant and GROW-HKC “interventionist” Janet Rojina records their latest body-mass data. Here in this quiet town on the wide-open rangelands of Klamath County, students have recently acquired an unlikely amenity: a rock-climbing wall. As P.E. teacher Jason Hardrath gathers the kids for a game of “pinball hockey,” they have trouble keeping their hands off the gleaming yellow fiberglass wall, its smooth surface pocked with brightly colored footholds and handholds. The wall was the brainchild of Hardrath, a triathlete and ultra-marathoner whose extreme athleticism and fitness fanaticism clearly has infected his students. Installed in the fall of 2014, the wall is a boon for Bonanza, a hub for the scattered ranches, dairies and farms spread across this far corner of Klamath County. Besides benefitting upper-body strength, agility and overall fitness, the chance to climb can be foundational to kids’ lifelong pursuit of movement. The boost to fitness began, in fact, even before the wall arrived. That’s because students turned out in huge numbers for a run-a-thon to raise matching funds for the $8,000 structure. The balance was seeded by a GROW-HKC grant. Read this story in Terra Magazine.